The factory chassis of your RV or motorhome is often not strong enough to support the additional weight added when towing. Damage may occur after towing, and a sub frame beef-up is a perfect solution. Nearly 75% of Americans overload their trailer hitch and overstress the frame of their motorhome while towing. This can lead to thousands of dollars in damages to the RV and risks injury through tow system and frame failure. 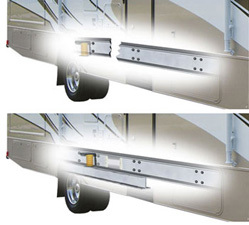 Chassis Frame Upgrade strengthens the weak connections formed when the RV was originally built, increasing the trailer hitch’s rated towing capacities on your RV. Don't leave your toys, cars, trailers behind by having your frame fall short when it comes to towing.